I picked up this book because the subhead read “Is he brave enough?”. I got curious and I wanted to read it. Do you think that’s a good reason? 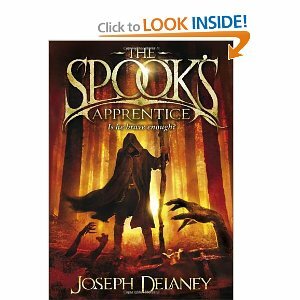 It is the first book in the Spook’s stories. I also know that this is probably a book that is not as well-known in the U.S. as it is in the U.K. because this author is from the U.K. This book was really interesting because of the concept of the seventh sons of seventh sons. Supposedly the seventh sons of seventh sons are always left-handed and can see things that you can’t see. The author really made it interesting. Some characters were good but forced to do bad things, and some were just plain bad. The plot was different and taught me about a lot of different things that I didn’t know about before, like boggart’s and ghasts and kinds of witches. The author used really good text to get my attention, it was marvelous! The story was surprising and not predictable, the protagonist seemed like any other boy. The only clues that he was special was his left-handedness and that he was like the Spook. The ending was really, really good! He even tells you some extra details after the book was finished. People who like fictional or fantasy characters like witches or boggarts will like this story. It is a great and fantastic book. I recommend you read it someday. I am going to look for the next book in this series. At the beginning of the story, you meet Tom (the protagonist), who is next to his dad talking to the Spook. Tom’s dad tells the Spook that Tom is the seventh son of a seventh son. Later on in the story Tom meets a girl named Alice (who is forced by her aunt Bony Lizzie to free the most evil witch, Mother Malkin. Alice does not want to do this, and when Bony Lizzie threatens Tom, Alice stands up and saves him. The adventures from there are many! Incredibly well written, Kurt. I love seeing how much you are learning. Fantastic job! Completely agree with Beth. Very nice review Kurt! !